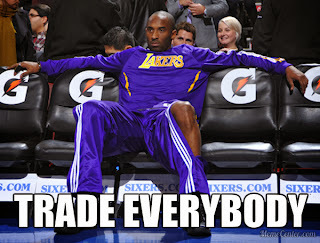 Not yet Kobe, not yet. at times and yes, I know the Lakers are one of the oldest teams in the league, but hear me out. The Lakers haven't been as injured as they were last year, far from it, having Steve Nash as the only opening night starter to have missed games due to injury. However, the players who have been injured, haven't played yet, or have had limited effectiveness due to injury, have been far more important, as Kobe Bryant has yet to play (though is, by all accounts, physically able to perform. He did return to practice yesterday and told former teammate Rick Fox on NBA TV "If there was a playoff game tonight, I'd play, I'd play. I don't know how effective I'd be, but I would play.") and Pau Gasol has been playing through a left foot strain since the start of the year and isn't properly conditioned thanks to having surgery on both knees during the off season. Nash hasn't been vintage Nash at all this year, and it was clear that he was injured when his shots were missing badly, something that didn't happen during Nash's relatively disappointing first season in Los Angeles, where he had a True Shooting percentage of 60% and was worth a .127 WS/48. Nash has a nerve root irritation and will be re-evaluated in five days. Getting Bryant back would be huge, even if he isn't immediately producing. His presence on the offensive end will help open up space for Gasol, Jordan Hill and Chris Kaman in the post, as well as drives to the hoop by Xavier Henry, Jordan Farmar and Wesley Johnson, not to mention pick and rolls with Steve Blake, who has been tremendous with averages of 10 points per game and 6.5 assists per game, while shooting 47.2% from deep. 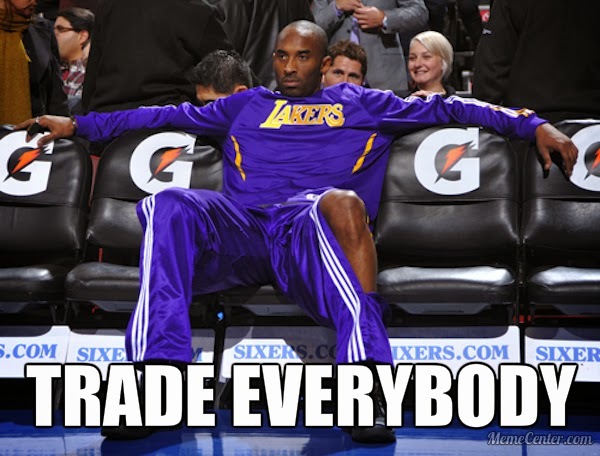 Bryant could also let the team give Gasol extra minutes on the bench to help rest his foot. With the Lakers bench being one of the best in the league this year, averaging close to 50 points per game and 22 rebounds per game, the Lakers starting unit has been lackluster in comparison, largely because the perimeter play has been simply bad and hasn't really opened up any space for Gasol to work in the low post. Obviously, getting Bryant in the game helps solve some of these issues, and helps improve the bench even further, as it would send one of Jodie Meeks or Nick Young directly to the bench. Meeks, in case you haven't noticed, has been great to start the year, leading the Lakers in scoring with 13.2 points per game, with a True Shooting Percentage of 67.7% (!) and providing a WS/48 of .134. On their good days, a fully healthy Lakers squad can run-and-gun with the best of them (Oklahoma City and Golden State), grind-it-out with teams like Memphis and San Antonio, and as we saw on opening night, keep up with more athletic teams like the Clippers. The only question is: Will they ever get completely healthy? My guess: probably not.